Purposeful design of campuses, buildings, social spaces and classrooms can facilitate deeper learning, greater social connectivity and a more discernible connection between the culture of a school and its architecture. This article is the second of a two-part series by Bek Park on behalf of Sunshine Coast Council, exploring what good design looks like in the context of a school, inspired by two local events: a presentation by Brisbane-based architects m3architecture on ‘Good Design for Positive Education Outcomes’ hosted by the Sunshine Coast Creative Alliance, and the Open House Sunshine Coast forum, ‘Architecture for Good’. The first article in this two-part series asked the question What is good design and how can it be applied in a school environment? This second article, speaks with Ben Vielle from m3architecture, exploring the benefits and outcomes of good design for schools. Undertaking a new development project is a significant investment for any school. With emerging evidence suggesting that learning environments can affect education outcomes, new construction projects are an ideal opportunity to develop innovative spaces that can enhance teaching and learning. Adopting good design principles offers schools a framework for approaching new projects. By embracing a long-term, “whole of campus” approach which acknowledges the school’s history, culture and vision, it is possible to create more effective learning spaces, enhance student engagement and avoid ad-hoc building projects that only offer short-term solutions. While outcomes manifest in different ways at each school, these effects are evident across all projects undertaken by m3architecture where schools have invested in good design. 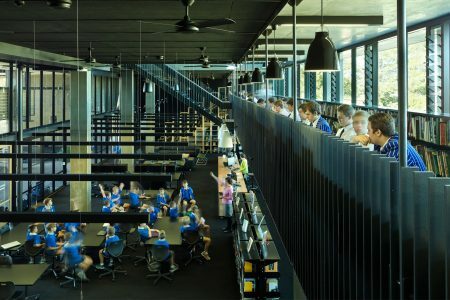 Take for example, the eight-storey Brisbane Girls Grammar School Creative Learning Centre, where classrooms are paired with an open network of balconies, bridges and Escher-like staircases. These areas offer alternative teaching spaces beyond the classroom that can be utilised on an ad hoc basis – performance classes make use of the tiered staircases for rehearsals and art classes commandeer corridors for drawing and painting practice. Like many recently constructed school libraries, the library in the Hanly Learning Centre at St Joseph’s Nudgee College has been designed to accommodate various styles of learning. Areas for individual study, small group study and classes are accessible in a variety of modes including collaboration, contemplation, didactic teaching and incidental learning. These spaces, combined with the school’s open and socially connected spaces have increased student engagement with the library, which had previously been located in the basement level of a building. Initial findings from a four-year study by researchers in education, design and architecture at Melbourne University support anecdotal evidence that innovative spaces promote learning: “Emerging (but limited) evidence shows a trend that spatial design does positively impact student learning outcomes.” While the research is yet to be finalised, Ben suggests there is mounting evidence of the impact of good design on learning. “What we are hearing anecdotally is that when the environment is designed correctly, students want to be at school, feel better about being there and consequently their potential to learn increases,” Ben said. Finding and augmenting the social heart of a school can enhance social cohesion and overall student experience. 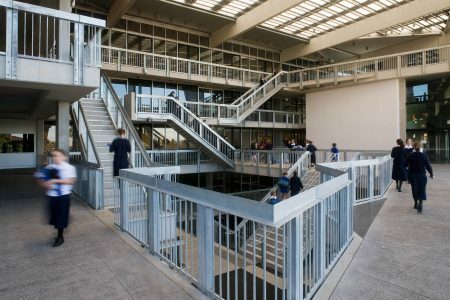 The Escher-like stairs have become the social heart of Brisbane Girls Grammar school, where girls gather during non-class times, music from the rehearsal space filling the air and impromptu performances by drama students offering lunchtime entertainment. At Nudgee College, the Hanly Learning Centre incorporates a large undercover common area for gatherings and events. An upgrade to the college’s Bathersby Boarding Village created an entirely new identity, a fortified courtyard, so boarders can enter another world with a visibly different landscape at the end of the school day. Anecdotal evidence indicates more consistent emotional responses from students and improved resilience when schools introduce thoughtfully designed spaces. 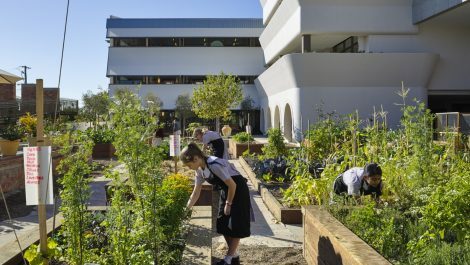 At Mount Alvernia College, where the architectural approach focused on gardens and wildlife designed to strengthen the ethical, spiritual and social agendas of the school, anxiety levels among students have decreased. “The principal has shared with us that kids go out to the garden if they are not coping, or feeling anxious or depressed. The environment helps them to manage their emotions and become more resilient which translates to a calmer culture across the campus,” explained Ben. When m3achitecture was first appointed to the Nudgee project, classrooms were spread across the site, making it easier for students to skip class but a new site plan with classrooms located closer together has resulted in decreased truancy rates. Ben concedes that measuring changes in academic performance is complex and generally attributable to a range of factors making it difficult to determine the impact of design on academic performance. However, evidence suggests it can positively influence study programs and facilitate pedagogical change. 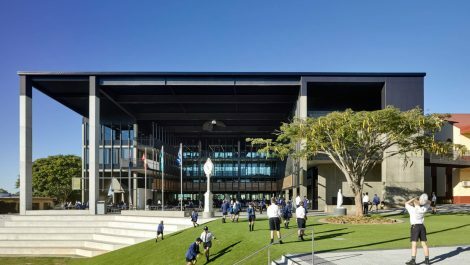 A key driver for the Hanly Learning Centre at Nudgee College was to bring an academic focus to a sports-oriented school. The Centre incorporates a library, IT services, learning and teaching department and classrooms in a theatre-like setting where major events and performances can also be held. The first major project at the college, the Tierney Auditorium, transformed a multi-function hall into a theatre and home for the drama department. The school subsequently expanded its existing performing arts program, with more boys enthusiastically taking up related subjects including audio visual traineeships. “The project facilitated growth and interest in drama and related subjects in a school that had been primarily sports-focused,” Ben said. While pedagogy evolves over time and adapts to the needs of each generation, the ability of a school campus to accommodate change is an important part of future planning. Teaching methodology at Nudgee was fairly traditional prior to the construction of new buildings, however the provision of different learning spaces is providing teachers the tools to introduce a more contemporary teaching methodology. Sustainability initiatives including utilising cross ventilation to maintain classroom temperatures and maximising the use of natural light reduce power consumption and therefore costs. Reports from Mount Alvernia College indicate energy costs have almost halved since new buildings were completed. Schools that offer diverse learning experiences and contemporary teaching methods as well as producing calm, socially connected students are in high demand. Places in each of these schools are now highly sought after and most have wait lists for new students. “Open days at Nudgee College were previously about showing off sporting fields and a few classrooms. No one wanted to see a library in a basement. Now, open days attract 4000 people and the school proudly shows off their facilities,” Ben said.